The Teach-A-Thon Challenge is an innovative campaign that challenges business professionals to step into the shoes of a teacher for at least one hour and teach a classroom of students. By experiencing first-hand the challenges of the teaching profession, the business professionals, known as Teacher Champions, become ambassadors in the community for recruiting, retaining, and rewarding quality teachers in our public schools. Recruiting and retaining teachers has become a national crisis, but it is made more difficult in South Florida where a limited amount of affordable housing and below average pay forces potential educators to pursue other careers. Teacher Champion volunteers train with expert teachers and learn what it takes to teach in the classroom. Like any walk-a-thon, it is both a fundraiser and an awareness campaign. Money raised by Teacher Champions benefits participating teachers of the Teach-A-Thon as well as The Education Fund's teacher grants and programs. Teaching quality is the single greatest determinant of student achievement. Nearly one-third of new teachers leave the profession after just three years; almost 50% are gone after five years. 9 out of 10 teachers have bought school supplies for their classrooms with their own funds (average out of pocket expenses total $800). How does this affect our community? Miami-Dade County Public Schools is the fourth largest school district in the United States, comprised of 392 schools, 345,000 students and over 20,000 teachers. Many students live in high poverty areas, in fact, 75% of students in M-DCPS qualify for federal free/reduced lunch. Only four out of 10 students from schools in high poverty areas go on to postsecondary education, reducing an annual earnings potential by more than $32,000. It helps to increase the appreciation for the teaching profession and raise funds for classroom grants. You can make a direct impact on students by exposing them to the business world. It’s fun and rewarding for business professionals and teachers! 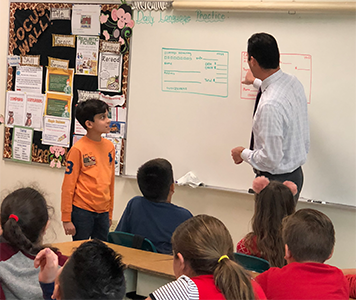 Teach-A-Thon Classroom Grants provide funds to teachers to develop and implement instructional projects that motivate and challenge students to learn. Our Food Forests for Schools, established in 51 schools, has helped to create a more than 52% improvement in students’ eating habits and 84% increase in students’ science achievement. Our SmartPath program (piloted in 3 high schools and currently in 5) has increased students’ college and postsecondary enrollment by 34%.